At the top is Spackman Equities Group, trading on the TSX Venture under the symbol SQG. Next is Spackman Entertainment Group, trading on the Singapore Catalist under the symbol 40E. 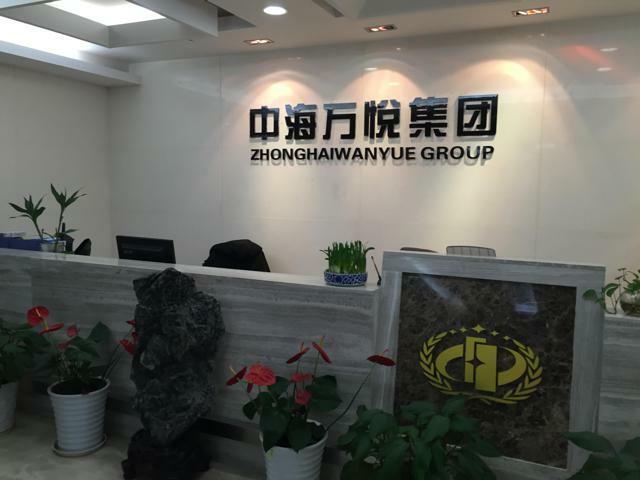 It is 38.77% owned by SQG. Next is Spackman Entertainment Group Hong Kong, which then owns the operating subsidiaries Zip Cinema and Opus Pictures, among others. 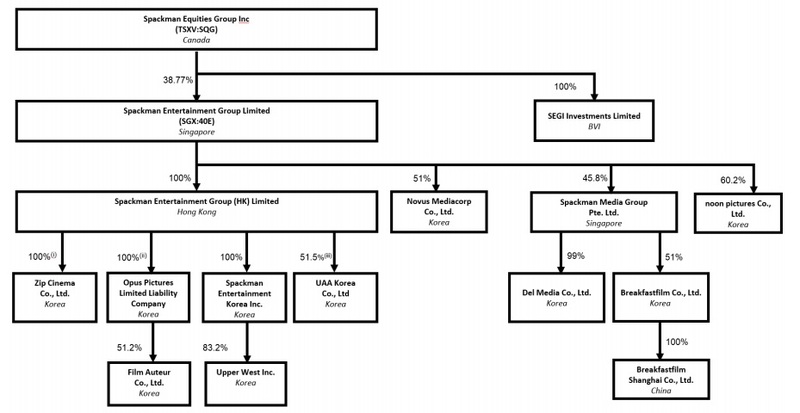 Spackman Media Group is 45.8% owned by 40E, which was recently spun out for a 27.4% ownership of the company after it lists on the Hong Kong Exchange. Charles Spackman may be a narcissist who is collecting multiple pay checks from different self-made companies that he runs, but I'm not so concerned about that. What I care about is if this group of Spackman companies can make me money, and I think they can. For the purpose of this discussion, I'll focus on SQG and 40E. The strategy and future direction section of the Management's Discussion and Analysis should provide enough of an investment thesis for this one. At the end of November, 40E was trading at $0.16 SGD, which translates to a net asset value of $0.16 for SQG. 40E has dropped about 20% since then to $0.13 SGD, but that still translates to a NAV of $0.13. SQG trades at $0.04, a massive discount to what it's worth. Not only is the discount huge, but the underlying, 40E, looks like it's going to have a big Q4. Spackman is a movie producer and entertainment company, and it just so happens that its movies' box office revenues are readily available from multiple sources online. In 2014 and the beginning of 2015, the company bombed, part of the reason for 40E's drop from as high as $0.40 to as low as $0.04. Spackman lost $8 million on $16 million in revenue last year, as the four movies it produced and/or presented did not do all that well. $2 million of the loss can be attributed to IPO costs. 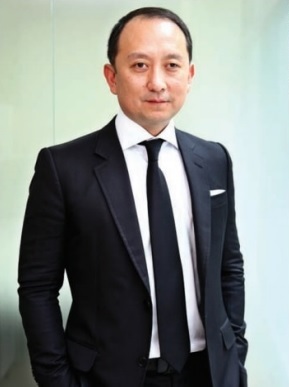 All of Spackman's financials are reported in US Dollars, despite revenue received primarily in Koren Won and that the stock trades on the Catalist in Singaporean Dollars. As producer (and sometimes distributor), Spackman is entitled to a portion of each movie's gross box office which varies depending on the role it plays. Opus Pictures produced and presented For The Emperor and appears to have captured over 80% of that movie's box office take. My Brilliant Life was produced by Zip Cinema and Spackman appears to have received 44% of that gross box office revenue. Big Match was merely presented by Opus and Spackman appears to have received only 10% of the revenue. 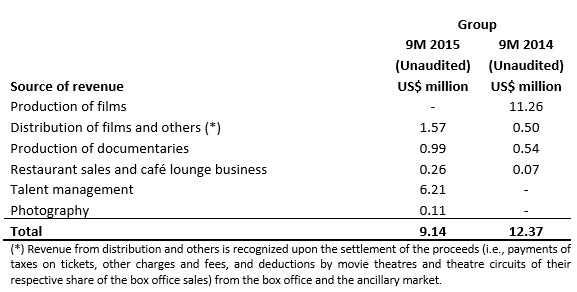 The profit and revenue figures in 2013 were largely driven by one movie, Cold Eyes, with Spackman achieving $10 million in revenue. This movie was a hit at the box office, with $35 million in box office sales, the 10th highest grossing movie in Korea in 2013. So Spackman had a 30% investment share in this movie. Obviously knowing what Spackman's investment stake in every movie it produces or distributes is key in trying to estimate financial impact. Voyage Research released a report on Spackman around the time of its IPO. While the report will be dated, it's an important read for anyone looking for background on the company. I draw attention to this chart which outlines the box office revenues and production costs (in Korean Won) each movie that the two Spackman subsidiaries have produced (even prior to being purchased by Spackman). At the time, Cold Eyes was one of the most successful movies, grossing 39.38 billion Won against 6.75 in costs, a 5.83 revenue to cost ratio. This is what leads me to believe that Spackman will have an excellent Q4. The Priests, produced and distributed by Spackman, grossed $36.4 million (over 40 billion Won) while it was in theaters in South Korea in November and December. It was the 13th highest grossing movie in the country for the year, and apparently set records for a November release, according to Spackman. 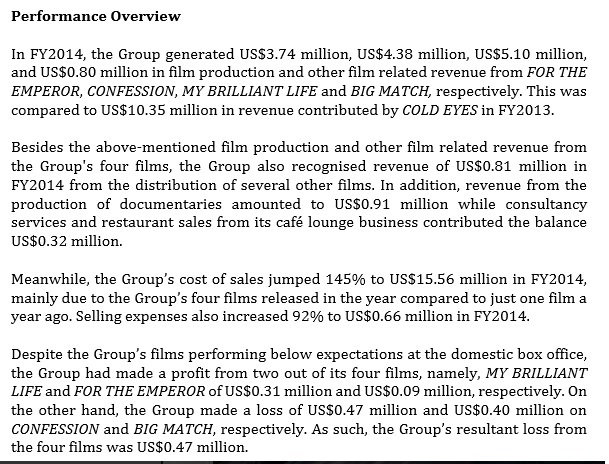 According to this press release, The Priests had a production cost (inclusive of advertising) of $5.9 million US, making its revenue to cost ratio 6.16, aligned with the two best performing movies on the list, All About My Wife and The Man From Nowhere. It's second to only The Man From Nowhere, having made $30 million after production costs. The question is how much of an investment stake does Spackman have in The Priests? If you see the company's news releases and their website http://www.spackmanentertainmentgroup.com/, everything is about The Priests. The company's news releases claim that its subsidiaries took a lead production and distribution role, so I am pretty confident that its stake is substantially higher than 30%, and probably more in line with 80% as in For The Emperor. But this is just an assumption made by me until I can get further information. Investors will need to come to their own conclusions. The first nine months of 2015 were poor due to the company not releasing any movies during this time period. The bulk of its revenue came from talent management through its UAA Korea division. Spackman converted $2M US worth of notes to get a 51% stake in UAA at the start of 2015. Spackman just disposed of that division for $2.1M US, citing that it was unprofitable and that the company wishes to focus on its movie business. So the end result is well timed non-core revenue to hide the brutal start to the year that ended with a $100K gain on sale of the division, notwithstanding any operating loss that the company incurred while holding this stake. I expect that Q4 will significantly add to the $9M in revenue for 2015 and get the company into profitable territory for the year. Last year the Q4 numbers came out on February 27th, with profit guidance commentary out on February 7th. For those interested, stay tuned as the first indication of how successful The Priests was should be out in three weeks if management follows the same schedule. If I was forced to come up with a guess, I would say that 40E makes $3-5M US in profits for 2015, or about $4-7M translated to Singapore Dollars. 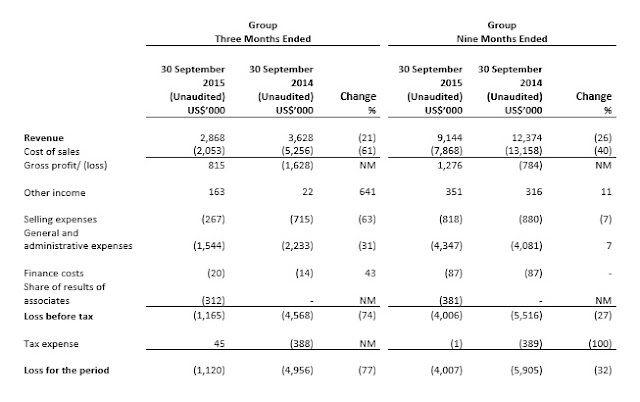 40E's market cap is about $50M SG, so a P/E of 10 for a growing movie company is pretty good. The issue is can Spackman continue to build on The Priests' success? It has a dozen movies in its pipeline expected to be released in the next couple of years. The company wants to release a minimum of four a year. Its current movie, Chasing, is not doing so well. From January 7th through 13th it has only $327K in gross box office sales (source), a far cry from The Priests. It's probably going to land around $2M in gross box office sales once it's out of theaters. Spackman's subsidiary Del Media (part of the spin out on the HKSE) signed a $3.6M US deal to for a Chinese reality TV show to be aired in February. The timing of revenue being recognized will depend on production, though I can imagine that Spackman will be "conservative" and book everything in Q1 once it has aired rather than a mix of Q1 and Q4. So I expect a very strong Q4 to be followed up by a mediocre Q1. But this should be enough to at least keep the stock in the low teens with the opportunity to push it higher if The Priests' numbers really work in Spackman's favour. This comes back to SQG. It's trading at more than two-thirds of a discount, and its value is concentrated in a stock that's got some pretty good potential and a ton of liquidity. I think Spackman should do a stock buyback. Given that 40E trades millions of shares in a day, SQG can easily let go of a few million without negatively impacting the stock price. SQG will then have enough money to buy back a higher amount of its own shares. It'll own a lesser percentage of 40E, but take a higher amount of shares back into treasury, so its NAV actually increases. Let's illustrate. SQG owns 154.6 million shares in 40E, worth $19.5M when 40E is 12.6 cents. At the time of this writing, the Canadian Dollar has conveniently dropped to par against the Singaporean Dollar, so no currency translations are necessary. SQG has 148.9 million shares outstanding, leading to a NAV of 13.1 cents. SQG now holds 144.6 million shares in 40E worth $18.2M. 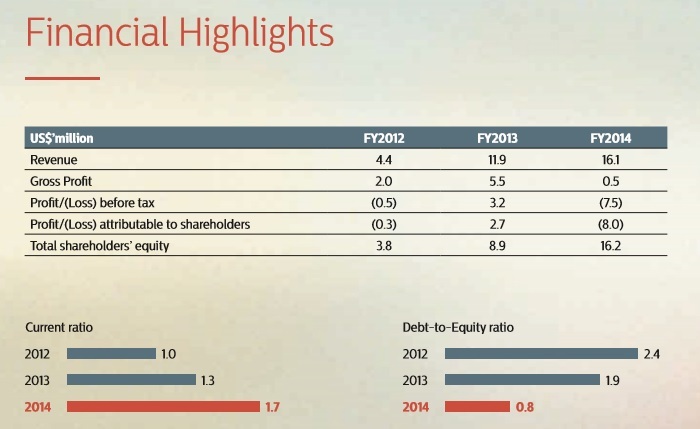 Its share total drops to 133.9 million so its NAV increases to 13.6 cents per share. SQG only has a few hundred thousand shares offered on the ask. So getting 15 million sharesat 8.3 cents is unlikely. This was just an example of how this could work. Now obviously management might balk at the idea of SQG owning a lesser percentage in 40E, even if it results in a higher share price and higher NAV. Alternatively, management could use the bonanza of cash from The Priests and low Canadian dollar to get 40E to buy up shares in SQG. The two related parties could cancel each other's shares out so that both SQG and 40E's share totals decrease. 40E already has a share buyback plan enacted, so why not do it in this creative and efficient way? This is where I get to the part that I don't like about the company. According to past press releases, Richard Lee is the IR contact at info@spackmanequities.com. I did not get a response from this address trying to make contact a few weeks back. 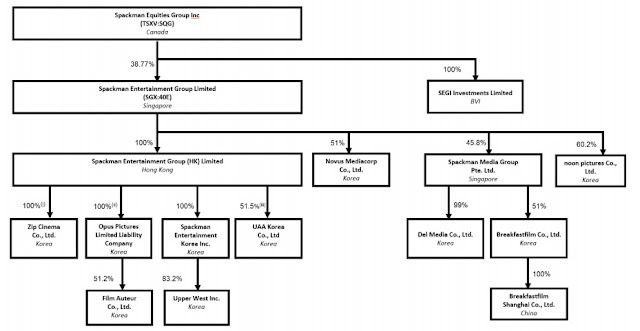 Now perhaps the Spackman team has been busy with The Priests and the various corporate structure changes over the past few weeks, including the sale of UAA and the spin off of Spackman Media Group onto the HKSE. But that's still no excuse. I have tracked down Mr. Lee on his LinkedIn account, where he is described as the "Head of Business Development at Spackman Entertainment Group". He also has Spackman Equities Group as one of the companies he follows. Now in the unlikely event that there are two Richard Lees in top spots at Spackman, I could be after the wrong person. But I am willing to take that risk and I suggest that anyone who buys into Spackman on my advice contact Mr. Lee and tell him what they think about SQG's low stock price. Give him the idea for a buy back so he knows that Canadian investors aren't going to sit idly by and let a stock that is clearly 2-3x undervalued remain as such when the company is perfectly capable of rectifying the situation. In fact, it's in their own best interests. The good news is that after doing some digging, I got into contact with Spackman Entertainment's IR representative, who recognizes Spackman Equities. I have sent them questions and suggestions, with some answers still pending. I'd still prefer to get into direct contact with management. Perhaps my writing on the company will spark their interest, as it shows there is some life in Canada and that someone cares about SQG. I'm rather new to the Spackman story and it's complicated by the fact that so much of the story is in South Korea and Singapore, two markets I am unfamiliar with. So there might be something I'm missing in my analysis and I encourage others to do their own research. I will continue to follow this story and update it as I learn more about the company. I own shares, purchased mostly in the 3.5 to 5 cent range. How is LongKey doing now? Is the automated process a done deal or still ongoing? What's the upfront capital requirement now, if any? Can they fund a partial roll-out based on existing cash flows? I know LongKey management is on board with the focus on Banlan, but what about ICBC and the 5,000 manufacturers, how long can they wait? This is the answer I got back from Johnson. So it looks like the IFS business is on hold for now, but LongKey is still active and working on a next generation solution. We should not expect any significant revenues out of LongKey until Peak confirms its focus back onto that business.